Because I’ve had a couple of emails about the techniques and process involved in creating these pieces, here’s a brief run-down on how they went together. They all started plain white fabric which was either left white or tea-dyed to give it a beige tinge. The fabric was torn to rough size and then ironed to freezer paper for stability. 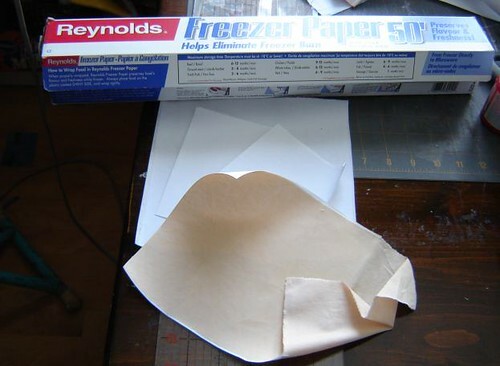 The freezer paper makes it possible to draw on fabric without having the material shift under the pen and seems to minimise the bleeding of paint and ink. I sketched out a variety of designs to determine how I was going to lay out each piece and to decide on which contortions would be the most effective for the tone I hoped to set. 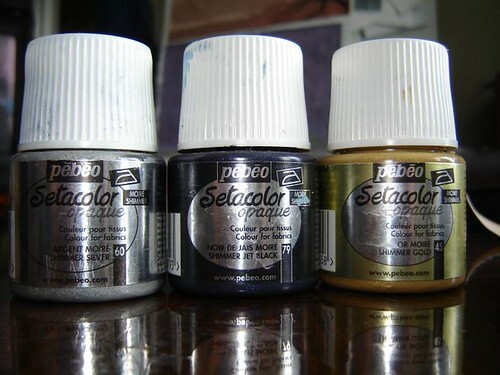 The paints used were Pebeo Setacolour transparent paints, tinged with the Pebeo Setacolour opaque shimmer. 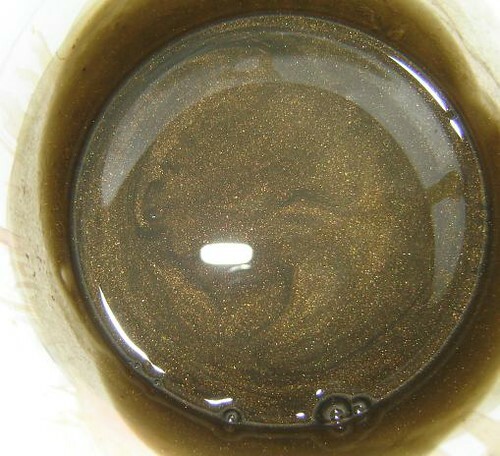 The shimmer colours used were pearl, black, gold and silver. 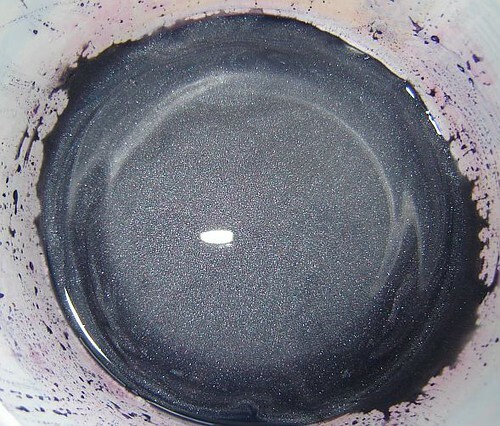 A variety of colours were used from among the transparent paints. I mixed the colours for background, trees and rocks from assorted combinations of these paints. The transparent paints tend to sink into the fabric and so create the colour of the background and the shimmer paints sit on the surface and create the sparkle of background and rocks. 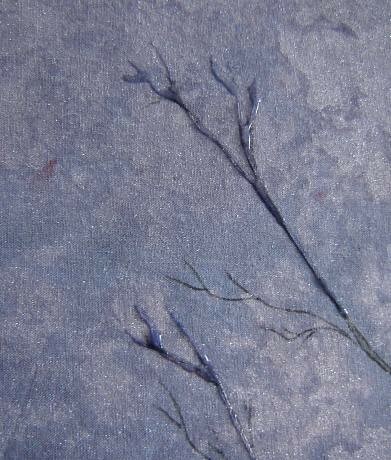 I redraw the lines of tree and rocks onto the fabric, using the preliminary sketch as a rough guideline. 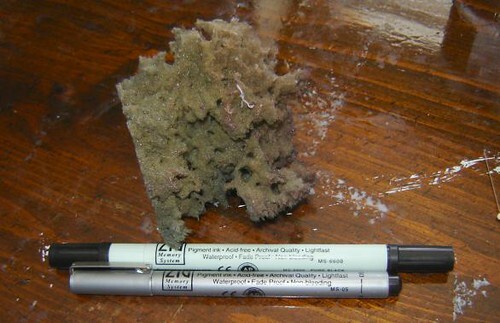 The pens used are Zig, black, 0.5mm tipped, acid-free and waterproof. I heat-set the drawing before applying paint. 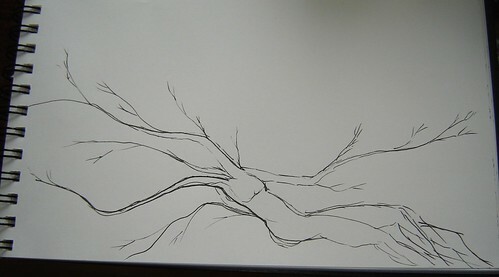 Using a fine-tipper watercolour brush or a drawing pen with a fountain nib, I apply the greys and blacks to the tree. This is a tricky part, because if you add too much paint to the fabric or water the paint down too much, it will bleed like billy-o and look rotten. Immediately after painting the tree, I paint the rocks in much the same way. After the tree and rocks have been painted, I use a sea sponge to dab the background paint on, being particularly careful around the branches. Then I wait until the whole thing is thoroughly dry and iron it to heat set the paint. 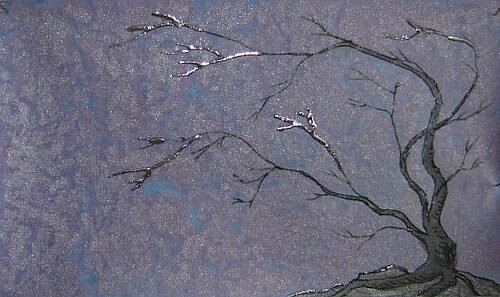 Using Jones Tones plexi glue, I outline the bits of branches and rocks that require foiling. I wait until the glue has completely dried clear. Too little or too much time and the foil won’t stick. 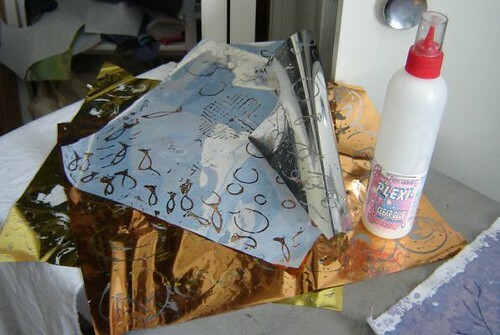 The sheets of foil are laid on, pressed onto the glued areas and carefully peeled back to leave foil on the glued areas. Lots of steps… still more to be done as regards the finishing process! Next Post Creative Progress, between projects. AHHHHHHHHHHHHHH I HAVE to try this in the fabric art journal thinhie!!!!! Oh, gorgeous. 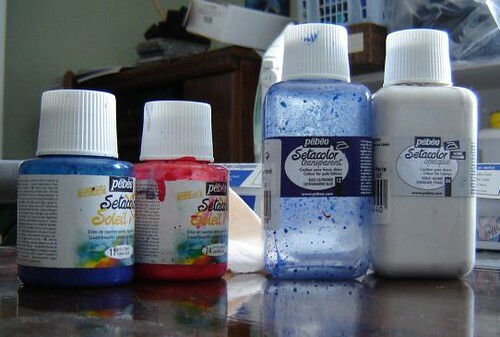 I just love the Setacolor Shimmer paints too.